A Sun Tunnel Skylight is also called a Solar Tube, Sun Tube or Tubular Skylight. When you install Solar Tube or Sun Tunnel Skylight you can qualify for a 15% Tax Rebate. We use the top Brands, Call and Ask for a quote! Aside from installing a new skylight we can also replace or repair your skylights. Do you have a old style dome skylight and want to replace it with an energy efficient glass skylight? Having any issue with your skylight leaking? Give us a Call for a FREE Consultation! Skylights can be complicated, from what kind to how you measure there are a lot of decisions to make. Knowledge is power, why get the wrong skylight? We have complied some information we think will help! Take a look, and if you still have questions give us a call! Skylights Of Los Angeles provides customers around Los Angeles, CA with various Skylights, Solar Tubes and Sun Tunnel Skylights services. We offer the best service with the most experienced professional quality craftsmanship. When you call us we give you a Free Phone or In-Home Consultation depending on your circumstance and what model of skylight or Solar Tube you are calling about. There are many choices when it comes to skylights and solar tube sun tunnel skylights, we have the experience to hel p you sort through all the information and make sure you get exactly what your looking for. It ultimately depends on your specific skylight project, give us a call and let us talk with you about all of your options. You need to make sure you get all the facts before making any skylight decisions, you don’t want to suffer the Leaky consequences! 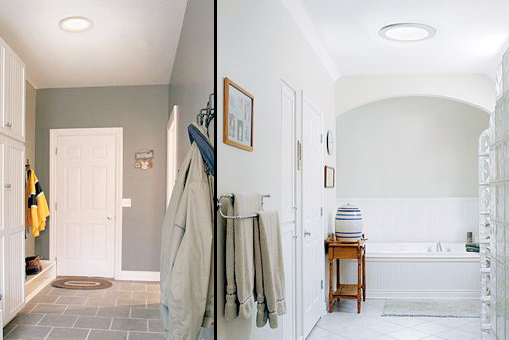 You have two main options when it comes to Choosing a Skylight. Traditional flat glass skylights are most peoples first choice after deciding they need more light in their home or office. Skylights are very similar to having a standard dual glazed energy efficient window installed on your roof allowing you to see out. The glass is the exact same, but skylights are flashed onto the roof in a way that insures they will not leak which is different from a standard window. This type of skylight also can make a room or space feel larger and more appealing, its been proven through scientific studies that exposure to healthy natural light (minus harmful UV rays which are blocked by the glass) can increase productivity, efficiency and also even our moods! Traditional flat glass skylights are typically considered the most appealing option but they also are more complicated to install and require more skill than solar tubes or sun tunnel skylights. Let us help you determine the best solution for your skylight application, give us a call today! The Sun Tunnel and Solar Tube Skylights are great if you just want an affordable option to bring light into dark areas of your home, they work by collecting light on the roof and reflecting it down through a metal mirror-like tube into your room. It looks very similar to a standard light fixture but provides cleaner natural white light and requires no power to produce the light. 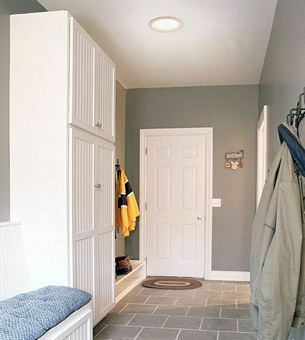 The solar tubes are great for entry ways, hallways, bathrooms, kitchens, family rooms, closets and any other dark area of your home. Solar Tubes and Sun Tunnel Skylights serve the same purpose as a glass skylight (bringing natural light from the outside into your home) but they are a less intrusive option that is considerably cheaper than traditional skylights. Skylights and Solar Tube Sun Tunnels are popular green product for daylighting installations in the Los Angeles area. A lot of our customers end up deciding they want to use Velux Products because of their superior performance, wide range of accessory items and outstanding warranties. It Does not matter what you need or want to do related with Skylights, Solar Tubes or Sun Tunnels. You need to give us a call and find out why we have so many Happy Customers! Call one of our Skylight Experts right now to have all your questions answered and so we can explain our process going forward. We want our customers to understand their options and feel comfortable making a decision. if you want Tubular Skylights, Sun Tunnels or Solar Tubes we can give you an accurate quote right on the spot. If you want one of our regular Skylights or Dome skylights we will have to come out and give you a Free In-Home Consultation but will be able to answer most questions prior on the phone. Everything related to Skylights is complicated from the Installation to repairs and replacements, all the more reason to make sure you have the right team working on your project. We Guarantee all installations with our famous No Leak Warranty! Replacing a skylight should also be considerably less than installing a new skylight, with an opening in the roof and ceiling pre existing the only work is on the roof. It really depends on the condition of the skylight to determine how extensive the work will be. Its not always as easy as putting one skylight off and the other right on. Sometimes you have to strip away all the material to the roof deck and re-install the skylight correctly insuring a proper seal to the roof. We will clearly explain what we think is the best solution for you and why we feel this way. We give you all the facts and then let you make an informed decision. Los Angeles Skylight repairs can be very difficult to diagnosis and even more challenging to fix. Repairing skylights in Los Angeles, CA can be especially tough because there are so many different roof types and unique designs. We give each skylight job a customized solution based on many variables like your house layout and severity of the damage. Our experienced skylight technicians at Skylights Of Los Angeles have the skill to handle any and all problems you might be experiencing from your Skylight. The most common skylight repairs are issues where water is leaking into your home or your experiencing structural damages because the skylight is old. Like most man made products, Skylights tend to need more attention and work as they age due to wear and tear. Most of the time you will start to see issues arise after heavy rain, water has a way of exposing problem areas by using them to get into your home. Typically unless your skylight is cracked or visibly broken the only way you can tell if its structural integrity has been damaged is with water. You should periodically check your skylights after rain to make sure there aren’t any small leaks. Obviously it’s best for you to catch problems with your Skylight in the early stages of the leaks development. Why Skylights Of Los Angeles? We offer the best solutions to any skylight project you have and our experienced crew will insure you get exactly what your looking for. We are a small company and that means you will be in direct contact with the Foreman and Owner through-out the entire process. Any questions or clarification you want will be given to you by the people that are responsible for this company. Real answers when you want them, we will not give you vague answers. Skylights Of Los Angeles offers it’s Skylight Services across Southern California from the Southbay up to Ventura County through the San Fernando Valley all the way over the the San Gabriel Valley including all the cities in between like Santa Monica, Hollywood, West Los Angeles, Sherman Oaks, Encino, Glendale, Pasadena, Los Feliz, Venice Beach, West Hills, West LA, East LA, Culver City, The Wilshire area, Westwood, Beverly Hills, Brentwood, Malibu and every other city in between.